First of all please notice the nice alliteration in the headline. A little problem which bugged me while searching the solution for  was that I had to change my checkstyle.xml and checkstyle-suppression.xml for several times. Unfortunately Eclipse-CS never noticed these modifications. So I restarted Eclipse every time to make the changes apply. And hey—after putting on my glasses and lowering the nose-screen-distance to “way to near”—there it was: a little yellow button on the preference page! 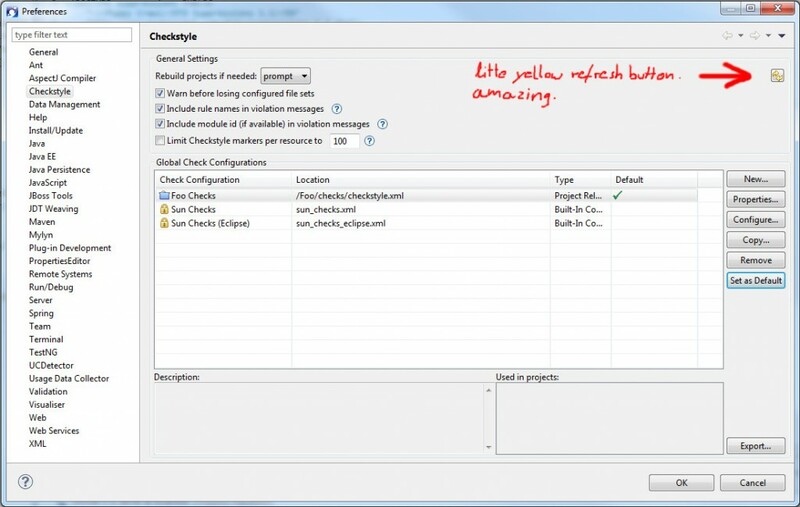 The little yellow checkstyle refresh button.